Demographics play a significant role in how much we spend and how we spend it. Spending is primarily dictated by age where different needs and life essentials change and evolve as consumers grow older. 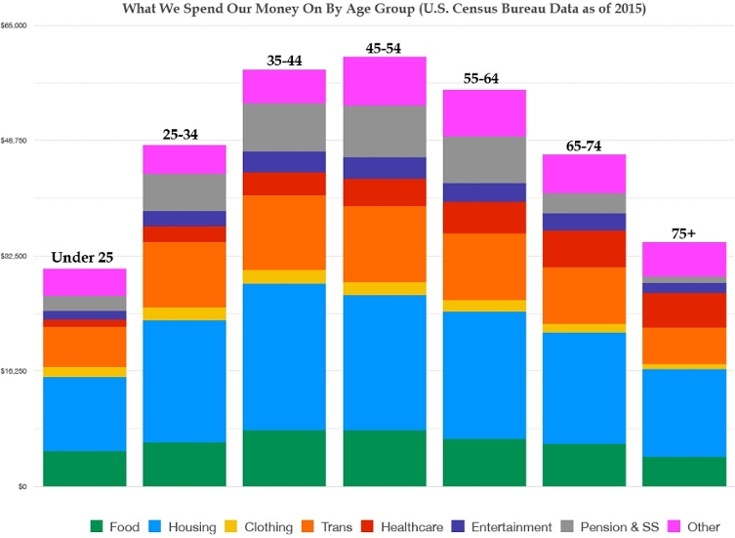 Housing, transportation and food are the three largest expenses incurred by all age groups. As consumers move from their late 20s into their 30s, we earn more money and families start to grow. Expenditures on transportation, health care and entertainment become prevalent as households grow with children. As we earn more, we also tend to save more in our 30s, 40s, and 50s by contributing to 401k plans and retirement savings. At 75 years of age and older, our retirement savings start to reduce as withdrawals increase to replace lost earned income.